'Volume Discounts & Loyalty Privileges Program' is a new and exciting sales program developed to reward all our customers, from individual purchases to retailers, with big cash discounts for their continuing loyalty and their volume of purchase. Customers will receive discount based on the volume of the transaction. In addition, each time you visit and make a transaction your item purchased value will be accumulated over a one-year period. This process of accumulating your item purchased values will further increase your discount savings on top of the volume discounts. Later, if you have reached an accumulated transaction value of over $100 in one-year period,you will get a ‘Loyalty Privileges’ 3% off regardless of transaction size. In Addition, if you qualify for both ‘Volume Discounts’ and ‘Loyalty Privileges’, you will receive discount on on both ‘Volume Discounts’ and ‘Loyalty Privileges’ discount rate. The chart below shows the discount rate you can receive on our ‘Loyalty Privileges’ program. * Sum total of your item values in one year period. The net purchase value is the net product value before discount. 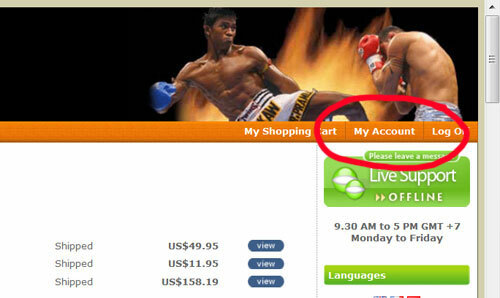 You can check the Loyalty point on "My Account" page on the top right corner as shown in the image below. Transaction 1. You make a first order. The item price is US$200. This transaction qualifies for a 5% Volume Discount on the item price. 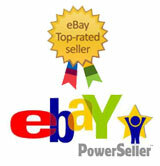 You received US$10 (200x5%) discount on the item price. Since this is your first transaction, you don't receive discount from ‘Loyalty Privileges’ discount. Therefore, the item price after discount is US$190 and the shipping price is US$50. You pay US$240. The item price of US$200 is accumulated. 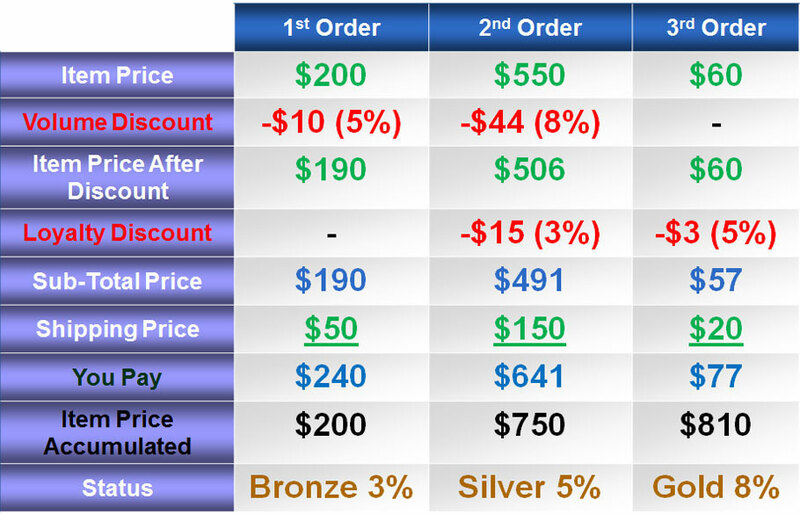 When your order was shipped, you will become Bronze Level ‘Loyalty Privileges’ members. You will receive 3% discount regardless of transaction size in the future. Transaction 2. After you received your order. You make a transaction again and the item price is US$550. This transaction qualifies for 8% Volume Discount on the item price. Your discount will be US$44 (550x8%). The item price after discount is US$506. You also receieve 3% discount from the Loyalty Privilege Program. 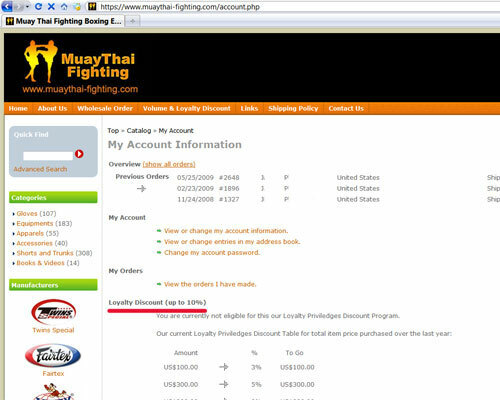 The Loyalty discount is US$15 (506x3%). Therefore, your item price after both discount is US$491 (506-15). The shipping price for this order is US$150. You pay US$641 (US$491+US$150). The US$750 (200+550) is accumulated. You become Silver Level ‘Loyalty Privileges’ members and receive 5% discount regardless of transaction size for your future order. Transaction 3. You make another item price purchase of US$60 within one year from your first purchase. This transaction does not qualify for the Volume Discount but you still receive 5% Loyalty Privilege Discount based on your account. Your discount will be US$3 (60x5%) from the Loyalty Privilege Program. Your item price after discounted is US$57. The shipping price is US$20. So, you pay US$77 (US$57+US$20). The US$810 (750+60) is accumulated. You become Gold Level ‘Loyalty Privileges’ members and receive 8% discount regardless of transaction size in the future. 1. The net item purchased value is the net item purchased value before discount. 2. The accumulated item purchased value will be accumulated for 1 year period. 3. The purchase value will be accumulated/updated when the order status was shipped. 4. The discount value will be deducted from total item value. 5. Shipping, insurance and sales tax will not be discounted. 6. The value of the return will not be included for discount point.